Home » How to Manifest » Are You Manifesting What You Expect? 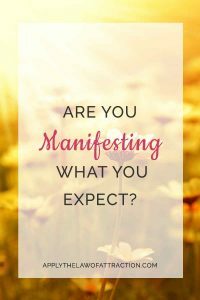 Are You Manifesting What You Expect? We often hear that manifesting and using the Law of Attraction are about your thoughts and feelings. However, your expectations play just as important of a role. You might even say that what you expect reveals your true thoughts, feelings, and limiting beliefs. You could describe the manifesting process as: think, feel, expect, manifest. What you expect is what you manifest. They even expect that if certain things happen, the outcome must be preordained. If a black cat crosses their path, it must give them bad luck, right? The black cat doesn't give them bad luck. They received bad luck because they expected it. But something sets you apart from these people. You know that what you expect is what you manifest. If you want things to change, you change your expectations. If you're used to failure or lack, how can you change your expectations? It's easy. Simply begin acting as if you expect good things to happen. Begin preparing for the things you desire to come to you. If there's something that you desire, but it seems very far off, begin expecting it to manifest now. The Universe works in unexpected ways, but it can only bring you what you desire when you're ready for it, so be ready for it now. If you desire a new car, make room for it in your garage. If you want a new relationship, start planning what you'll wear on your first date – look in your closet, go window shopping. If you want to manifest a new house, start looking at houses. Look at ones for sale online. Go to open houses. Drive around neighborhoods to see where you'd like to live. Just do something to show that you expect your desire to come to you. Do you expect the worst to come? Do you expect things to get better? Do you expect to manifest your desires? This always seems to be the hardest part of manifesting – keeping focused on good things and expecting that good things will happen. Thanks for your thoughts. I’ve enjoyed your other posts and will keep coming back. Just keep taking baby steps Belinda and you’ll get there. Good luck with your manifestations! If there’s any more I can do to help, let me know. Thank you Elizabeth for this wonderful article on the Law of Attraction. It breaks down this process into three simple steps that we can all remember; be aware of our beliefs and thoughts (even those unconscious ones) and to be present. I love to say, Focus on what you want not what you don’t want. And staying in a state of Joy and Gratitude helps keep our energy or state of consciousness at a high level so we can attract what we really, really want. Great tips! I completely agree Eduardo. The more you enjoy your life and keep your energy high, the faster the Law of Attraction works. It’s amazing how easy it can be.